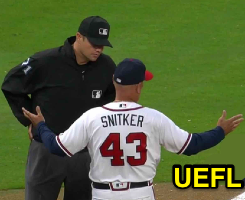 3B Umpire Jordan Baker ejected Braves Manager Brian Snitker (check swing call) in the top of the 9th inning of the Phillies-Braves game. With one out and none on, Phillies batter Cesar Hernandez attempted to check his swing on a 1-2 slider from Braves pitcher Arodys Vizcaino, ruled a ball by HP Umpire Jerry Layne and affirmed as "no swing" on appeal by 3B Umpire Baker. Play reviewed and adjudicated by the UEFL Appeals Board (6-2-1), the call was correct. At the time of the ejection, the game was tied, 5-5. The Braves ultimately won the contest, 8-5. This is Jordan Baker (71)'s first ejection of 2018. Jordan Baker now has 4 points in the UEFL Standings (2 Previous + 2 MLB + 2 Correct Call = 4). Crew Chief Jerry Layne now has 1 point in Crew Division (0 Previous + 1 Correct Call = 1). This is the first ejection of the 2018 MLB regular season. This is the 1st Manager ejection of 2018. This is Atlanta's 1st ejection of 2018, 1st in the NL East (ATL 1; MIA, NYM, PHI, WAS 0). This is Brian Snitker's first ejection since July 7, 2017 (Mike Everitt; QOC = N [Check Swing]). This is Jordan Baker's first ejection since Sept 15, 2017 (Willson Contreras; QOC = N [Balls/Strikes]).